Rolling Meadows, IL, USA – May 29, 2013 – Laser cutting and converting equipment manufacturer, Spartanics, announces the sale of their L-350 Laser Cutting System to General Label & Printing, Inc. in El Paso, Texas. The system includes a 400W laser, two-sided lamination, uv varnish, rotary sheeting and die cutting, slitting, back scoring and Spartanics’ Change-on-the-Fly Barcode Reading software. The system was purchased to provide General Label with greater flexibility for material substrates and cut configurations along with a reduction in job change over time. Established in 1987, General Labels and Printing is dedicated to the manufacturing of pressure sensitive labels and distribution of packaging related products. General Labels and Printing provide labels and associated services to worldwide manufacturers in the automotive, consumer electronics, medical device and food packaging industries. Laser cutting technology is revolutionizing the way that printing and converting companies produce products. The technology helps eliminate long lead times, expensive tooling and excessive material waste. Printing companies have become more accustomed to shorter job runs, private labeling and decreasing profit margins and laser converting equipment is one way to address these market changes. Spartanics has been manufacturing laser die cutting systems, steel rule die cutting systems, screen printing lines, automated counters and other equipment since 1963. 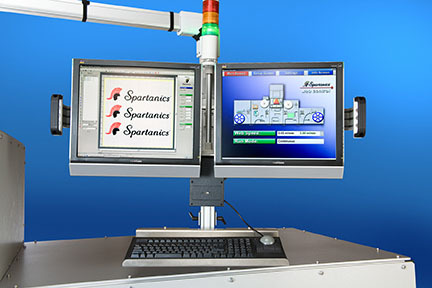 Spartanics is available for technology demonstrations and contract manufacturing services.